Yes We Print Screen printing shop provides bottle printing service in Downtown, Los Angeles. 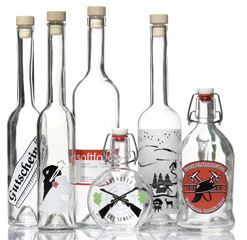 We can print your bottles, glasses and cups with your desired design. The bottles are provided by customer and we print them, in case of need ship to customer. An individual printing is ideal for: parties, companies and clubs! Basically, there is a wide range of printing options! Single-color or two-color bottle printing patterns are particularly suitable for direct printing. The number of colors, color selection and the proportions, which should be selected suitable for the bottle. Note on printing inks: It is not printed in the Patone color system! Color information in this color system can only be understood as a color guideline because we have to mix these desired colors by hand. The subsequent penetration of the paint can lead to color variations here. What items can we print? What information do we need for the bottle/glass printing? What type of print artworks formats do we need and how does the print work? Ideally you can provide us with the print data as vector graphics in .pdf, eps or .ai format. For simpler desing with not too many details, we may also be able to work with a high-resolution .jpg image file. Vector graphics are characterized by the fact that they can be enlarged arbitrarily and no pixel artifacts arise. Please do not embed pixel graphics in your pdf files. Technical background (for graphic artists): We do glass printing with screen printing or Pad printing depending on item. For this purpose, special frames are covered with a coated fabric on which your design is exposed. These exposure areas are then washed out so that later color can be transferred to the bottle. If the details of your decor are too fine, it may happen that the sieve can not be washed out properly and lines are not displayed through. It can also come to a color gain when applying the color, which makes the lines appear slightly thicker. If possible, you should convert to paths, or tell us the appropriate fonts, if it is not a standard font. We recommend a minimum font size of about 10pt for pamphlets. What colors can we print on glass? Please note that different screen calibrations can lead to color deviations. Color specifications in PANTONE: We make every effort to match the color you have chosen as well as possible, but for smaller runs of less than 3,000 pieces, the colors are mixed by hand and may deviate from the specifications. Please also note that the baking process of the color in the oven causes color deviations. For directly adjacent colors, we need to reinforce the contours and print one color slightly over the other, so there will be no gaps in the event of any offset. Depending on the degree of coverage of the color, slight color changes may occur at the overprinted areas. Can printed bottles be in the dishwasher? How durable is the print? What does the bottle printing cost? The prices depend on the number of colors and the volume. Ask the prices directly from us and we will make you an individual offer. We accept online payment, Visa, Master, American Express and cash. How do you ship the printed bottles? We pack the printed bottles and ship with UPS or FEDex. What is lead times / delivery times? Please discuss delivery dates (depending on quantity and capacity) with us in advance. By placing an order, you confirm that you own the right to logo and do not violate any third party rights and / or copyrights. Your company needs custom printed bottles, cups or glasses? Your company logo can be branded! Ideal for customer loyalty, as a give away, as an advertising medium or as a company present! Fill the bottles with your favorite distillate and leave a high percentage impression! Your club is looking for individually screen printed bottles, glasses or cups? We brand your club crest! for anniversaries as a lasting memory! as a gift for the club members! filled bottles as high percentage winner or participant trophies! Are you looking for a gift for your wedding with taste? Give your wedding guests a special gift with a very special touch. … or as an individualized advertising medium – There are enough occasions for plastik bottle printing in Los Angeles! We will gladly advise you and create an individual offer. Settlement from one source. Design your logo according to your ideas. So, simply email us your logo: info@yesweprint.com and you will receive a non-binding offer!